A Traumatic brain injury (TBI) is defined as a non-degenerative, non-congenital injury to the brain from an external mechanical force, possibly leading to permanent or temporary impairment of cognitive, physical, and psychosocial functions, with an associated diminished or altered state of consciousness. 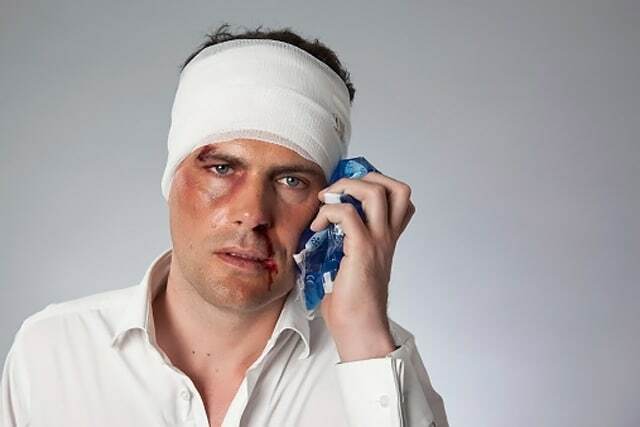 A TBI is typically caused by a violent blow to the head, an object penetrating the brain tissue, or even medical errors. A more mild TBI can result in only temporary effects, but more serious TBIs can result in bruising, torn tissue, internal bleeding and other complications which often result in long-term disability or even death. The people who are most highly at risk for TBIs are children from infanthood to 4 years old, young adults between 15 and 24, adults age 60 or older, and males in most age groups. Falls such as falling out of bed, from a ladder, down a flight of stairs, or in a bath. These are more serious in children and the elderly. Vehicle Collisions. Automobile accidents in any form – cars, bicycles, motorcycles, and pedestrians included – are a common cause of TBI. Violent acts such as gunshot wounds, domestic violence, abuse and assault, as well as shaken baby syndrome are all known to cause TBI in people. Sports injuries can cause a TBI, especially in children. Football, boxing, baseball, lacrosse, hockey, and extreme or high-impact sports are more notorious for these injuries. Explosions and combat injuries are a common cause of TBI in military personnel. Traumatic brain injuries can be devastating to both the injured and their families. They can cause sudden and irreversible personality changes in a person, as well as end with permanent changes in cognitive or motor function and can limit their ability to work. As with any major injury, the injured and their family may find themselves in emotional upheaval, drowning in medical bills, and having to try to deal with insurance companies. At Ronemus & Vilensky LLP, we are experienced NYC brain injury attorneys who will fight for you and your family. If you or a loved one is suspected of having received a traumatic brain injury, you need to get immediate medical attention and address any physical or mental symptoms as soon as possible. If you or a family member has suffered a TBI, there may be more than one part responsible or at fault for the injuries. When it comes to litigation, TBI cases are generally determined by a jury as part of a civil lawsuit. Our brain injury lawyers know how to fight for you in these often complex medical and personal injury cases. Our team works with medical professionals, expert witnesses, and insurance companies to make sure you get compensation for your injuries and for medical bills and expenses, ongoing treatment and therapies, lost wages, long-term care, and pain and suffering. Our client was a 26-year-old college student who was riding in the back of a taxi when it was hit by another car. Her head struck the plexiglass divider in the taxi and she was treated and quickly released from the hospital. She had headaches and cognitive difficulties and returned to the hospital, where they discovered bleeding in her brain. She was able to go back to school for three more semesters, but her symptoms persisted. She had difficulty understanding and learning, memory problems, comprehension issues, headaches, anxiety, and confusion. She has since been unable to hold down a job for long and has carers who come to her home to help with daily tasks. She has been diagnosed as permanently disabled and a jury awarded her $10,800,000 for lost earnings, medical costs, and pain and suffering. Our client was a 28-year-old accountant and sustained a brain injury when she was hit by a car while crossing on a crosswalk. She was unable to recall the actual accident and hit her head on the concrete and was later diagnosed with a mild TBI. She continued to try to work at a large accounting firm for two more years, but was plagued with concentration and memory problems. Our client was later diagnosed with traumatically-induced epilepsy and is now on social security disability. The jury found the van driver and his employer responsible and our client was awarded $7,400,000 for past and future pain and suffering and lost wages. Our client, a 38 year-old high school guidance counselor, sustained a brain injury after being struck in the head by a door at the school at which he worked. The client walked through the left door of a pair of swinging doors while walking downstairs during a fire alarm. To get to the left door, he was required to walk in front of the right door, which was pushed by a student and struck our client in the head. Over several months, he lost his balance, developed the inability to speak properly, and became hypersensitive to noises. He has been disabled since the accident and now receives social security disability. The jury found the Board of Education was responsible for maintaining a dangerous and defective door and awarded our client $6,000,000 in compensation. Our client suffered fractured facial bones and traumatic brain injury when he fell from scaffolding on a movie set. He was unable to return to work as an artist in charge of major movie sets. The insurance company offered just $300,000 to settle the case while the jury was still deliberating, which we declined. The jury awarded our client $3,650,000 in compensation. When it comes to traumatic brain injuries, you need an attorney you can trust and one who can take care of the case for you, leaving you to focus on getting healthy and recovering. Ronemus & Vilensky LLP is here to help.